Home Blog What Can Lasers Do For You? One of the more intriguing uses of laser technology over the last few years is the treatment of burn victims from the Iraq and Afghanistan Wars. 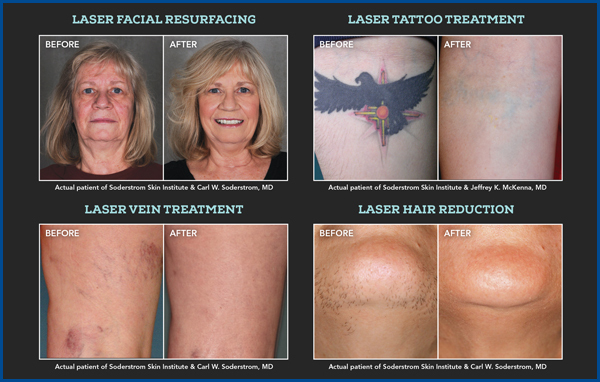 These severe scars can be treated with specific laser beams to help diminish and smooth them out, and in some cases, bring the skin back to normal texture and configuration. This is also possible for surgical scars — even hard, raised or discolored scars can be softened and flattened by laser treatments. Laser beams that are absorbed by water have also been devised. Water in skin cells absorb certain laser light and therefore the textured skin of the face, lines and wrinkles in those areas can all be treated with laser beams. Fine lines and wrinkles are not only treated that way, but laser beams that break up the collagen that has been damaged and healed in a weblike fashion from sun damage can be broken up and as it heals, it heals back more towards normal. Therefore, lines, wrinkles, sun damage and furrows on the skin can all be smoothed and improved greatly. This is also true for acne scars and wide pores. Pigment on the skin is also treated well by lasers that are absorbed into the brownish color pigment. This can treat pigment spots on the face, chloasma, melasma, and lentigines up and down the backs of the hands and forearms in people who have had a lifetime of sun exposure. Warts are interesting because the laser beam is absorbed through the wart and into the blood vessels that feed the wart, drying up the blood vessels and starving the warts to death. The hair follicle is penetrated by laser light. Once the follicle is affected by the light and heat of the laser, it becomes thinner and lighter in color. In some cases it disappears completely. Repeated treatments are usually needed for optimal results. The Illinois Dermatology Society has worked hard with the Legislature over the past few years to define rules by which lasers are used in the State of Illinois on patients. Those rules require certain expertise, such as physicians to be available in some cases or present, if not doing the lasers themselves. In addition, it should be noted that there are risks with all treatments, including burns, scars, infections, increased and decreased pigment and others. Talk to your physician before beginning any laser treatment program. Make sure an experienced laser professional is treating your skin. Soderstrom Skin Institute is celebrating 40 years in Central Illinois and is proud to announce the opening of their new office at 2100 Jacobssen Drive in Normal. For additional information on their laser treatment program, contact them toll free at 888-970-7546. To schedule a consultation with Board Certified Dermatologist Carl W. Soderstrom, MD at their new office in Normal, please call 309-268-9980. Before and after photos are available at SoderstromSkinInstitute.com.